Exploit protection trigger when you launch hp recovery manager. No clue if it's something you need to fix or vbs scripts launching always give an exploit alert but just letting you know. I had a similar issue with Dell Command Update that I did not post here. Instead I supplied the utility by sending to [email protected] The issue was fixed. 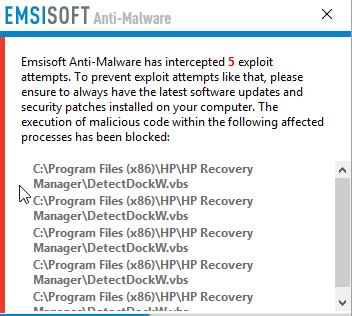 If that DetectDockW.vbs persists in that directory, then you'll want to send it along with the HP Recovery agent.